The Classic Accessories generator cover keeps dirt, debris and weather out of your generator motor for use in storage or on the job. Coated for maximum water resistance and repellency, the heavy-duty fabric won't shrink or stretch, and will protect your generator from rain, snow, sun damage, dust, tree sap and birds. An elastic shock cord in the bottom hem provides a slip-on, custom-like fit, and installation and removal are quick and easy. The design includes a handy integrated storage sack. This large cover comes in black and fits generators measuring 35-by-24-by-30-inches (LxWxH) and up to 7000 watts. That's Earl Muntz in the center of the wheel cover. Earl 'The Mad Man' Muntz was the a typical entrepreneur. He began in radio in the early forties and started in 1949 selling the first televisions for mass market as a Dumont Television franchiser. As a result he made millions of dollars. In the early fifties he meet up with various prominent car dealers in the area and worked out promotions where each would share showroom space and promote each others merchandise. Earl wanted to have his televisions in as many auto showrooms as possible and offered auto dealers huge giveaways of his televisions. One such dealer was Frank Kurtis who was tinkering around with a failing self promoting sports car called a Kurtis. A general motors dealer in Inglewood California. The two discussed the possibilities of offering a new, sporty southern California type of automobile to the public. This discussion was rumored to have initiated out of learning of the Nash-Healey union in 1953. KurtisMuntz Jet The original 28 Muntz Jet prototypes were built in Gardena, California in 1951 or '52. All had lift-off tops and Cadillacs 331 cid V8. These prototype were assembled with a mixture of current parts from other contemporary cars and custom parts. Most body panels were aluminum formed over a steel cage subframe on a 'X' frame chassis. The car was well received in showrooms across southern California and signups with deposits were large enough to satisfy a start of production. A numerically lower final drive ratio gave the Muntz jet a higher top speed than the Kurtis, and Muntz claimed a 0-60 mph time of as low as nine seconds. The jet was much heavier and far less agile, however. Production was shifted to Earl's hometown of Evanston, Illinois, where the power train was changed to the Lincoln L-head V8. In the production stage, final numbers built was 366. With the prototypes from California total production was 394. Muntz lost about a $1000. on every Jet he sold, the main reason he gave up on the venture after four years. Earl went on to develop the 4 track and 8 track tape car stereos and continued to promote the large big screen TV's when first developed in the early eighties. I believe he died at the age of 89 in 1991 or 92. This was gonna be my 52 Week of Brittany picture for last week. But then I took the cat picture. Which is by the way, my most popular photo ever. So, thank you everybody for that. Even though it didn't make Explore. Ohh well. Any way, I took Brittany petsitting with me and let her just lay in the car and hang out (windows down all the way). She suprisingly didn't whine much. I'm in the door as a reflection. And you can see the inside of my car. Which looks nice, but you can't see that it lacks power windows. Lol. It's aight though. I love TInkerbell and her non electric self. I was thinking about how I am and I realized I DESPISE change unless I decide I want it. Like if my mom offered me her convertible PT Cruiser, I'd rather keep Tinkerbell. And today she bought me a really nice phone which had a full keyboard and internet. I told her to return it. lol. I like my old little phone. I think I'm an odd child. Actually. I think it is more like I feel as if I am betraying my objects. I feel bad for my point and shoot that I have stopped using it. I think that would be my issue. Well with the car and camera. As for my phone, I'm lazy and don't feel like getting used to it and everything. Though I did thank my mom for it and think she was a bit relieved I didn't want it because in order to get it she had to get internet for a year which after she thought about would be quite expensive. The most complete edition of the finest wet stone sharpening system available, the T-7 is rated for continuous use and has a vast array of specialty jigs available so you can quickly and easily sharpen virtually any tool in your house, backyard shed or workshop. The heart of the T-7 is the Tormek SG-250 10" x 2" grinding wheel turning at a slow 90 rpm through water which acts as a lubricant for faster grinding while it continuously cools the tool edge to prevent "bluing" the metal. After grinding, the 8-3/4" x 1-1/4" genuine leather honing wheel gently removes the burr and hones the edge to razor sharpness. The T-7 System also includes the Angle Master, Honing Compound, Stone Grader, Diamond Truing Tool, Square Edge Jig, and Handbook and Instructional DVD. Seven-year warranty. Combining a water-cooled, slow-speed, durable grindstone with an angle guide for precision, the Tormek T-7 Water-Cooled Sharpening System is ideal for professional sharpening applications. The T-7 improves the ease, accuracy, and safety in edge tool sharpening thanks to two innovations: a Square Edge Jig and a Diamond Truing and Dressing Tool. The SE-76 Square Edge Jig automatically aligns the chisel for precision sharpening, and the Diamond Truing and Dressing Tool helps you keep the stone in perfect condition, which is essential for a perfectly sharpened edge. Ideal for sharpening woodworking hand tools, knives, and scissors. The slow-speed, wet grindstone of the Tormek T-7 uses less friction than a dry grinder and won't remove as much material from the tool during sharpening, giving you a sharp, clean result and a longer-lasting edge. 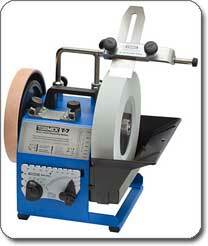 Unlike with dry grinding, you won't have to worry about burr build-up, overheating, or the need for frequent sharpening. With 11 jigs available for most types of wood-working tools, knives, and industrial tools, the Tormek T-7 maintains the precise edge and angle for each specific tool. It removes only a fraction of the steel, and the jigs guide your tools for accurate and efficient control of the shape and edge angle. The Tormek T-7 comes with a square-edge jig for chisels and plane blades, and there are additional jigs available for knives, scissors, axes, gouges, and more. Aligns a wood chisel automatically parallel to the Universal Support. The included SE-76 Square Edge Jig is ideal for quickly clamping and holding chisels, plane irons, and even short and tapered chisels (like Japanese chisels) for accurate sharpening. Conventional jigs require that you align the tool in the jig with two mounting screws, a time-consuming process that results in loss of accuracy. The new Tormek Square Edge jig solves this problem by squarely lining up the chisel at 90 degrees each time--without any adjustments. This is achieved because the jig automatically aligns the chisel to its flat, machined face. The SE-76 jig can handle blades up to 76 millimeters or 3 inches in width, and it includes safety stops, which prevent tools from slipping off the stone. The Universal Support incorporates a micro adjust for fine setting. The Universal Support mounts vertically or horizontally to the base of the Tormek T-7. Simply raise and lower the Universal Support with the help of the AngleMaster to achieve the desired sharpening angle, or mount it horizontally for honing away from the edge. 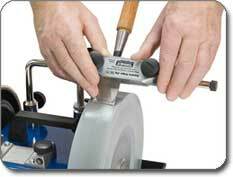 Honing on the leather honing wheel can be performed with or without the SE-76 jig and with the Universal Support as a tool rest. 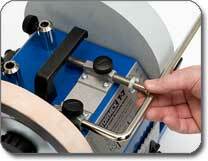 Grinds your tool to any desired edge angle from 10° to 75°. View larger. Regardless of wear and tear on the grindstone, the included AngleMaster will help you achieve the exact angle you need every time. With a range of 10 to 75 degrees, the AngleMaster allows you to set the angle of the jig to the grindstone, and it can also measure the existing edge angle of a tool. For further convenience, magnets keep the AngleMaster securely in place. The stone grinds very effectively and gives a fine finish to the tool. View larger. 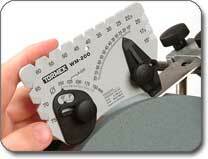 The Tormek T-7 Original Grindstone can be dressed to 220 grit or 1,000 grit for versatility. The stone comes with a 220-grit surface, and the included Stone Grader allows you to quickly and easily change the surface to 1,000 grit for fine polishing. Since you won't have to change the jig or the stone, the Stone Grader allows you to perform both efficient steel removal and a fine finish with one stone. 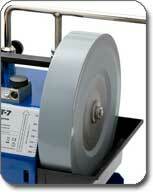 The Tormek T-7 uses a 10-inch by 2-inch stone wheel, giving you a wide and durable surface for sharpening. 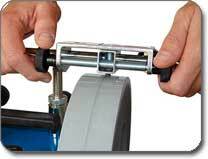 The powerful, heavy-duty motor turns the wheel at 90 rpm and can be run continually. For further convenience, the T-7's stainless steel shaft with E-Z Lock feature means you can remove the grindstone without tools. With TT-50, you can true and dress your grindstone round and flat. Using a cluster of diamonds to smooth the surface of the stone, the included Truing and Dressing Tool with screw feed can restore a worn stone to an even surface. It mounts and locks instantly on the Universal Support, ensuring that the stone surface is always parallel to the tool fitted in the jig. This enables you to keep the stone in perfect condition, which is essential for a perfectly sharpened edge. The T-7's advanced water trough comes with an enlarged standard lip for maximum water collection. It also includes an embedded magnet to collect steel particles and a removable water chute for long tools. Because steel particles are deposited into the water trough and wet-grinding doesn't create grinding dust, there is no need to worry about air pollutants. The low speed also eliminates sparks and allows the operator to have complete control of the tool. The Tormek T-7 Water-Cooled Sharpening System is backed by a manufacturer's seven-year limited warranty, which includes commercial use. Tormek T-7 Water-Cooled Sharpening System, Square Edge Jig, AngleMaster, Honing Compound, Handbook, Truing tool, Stone grader, Accessory tray for storage, and instructional DVD.